2005-08-18 Application filed by Nielsen Media Research, Inc. filed Critical Nielsen Media Research, Inc.
 FIGS. IA and IB illustrate example audio stream identification systems for generating digital spectral signatures and identifying audio streams. [OdtC- j" '1F rI a:itfmiFdi-fflMn representation of an example monitored audio stream and a plurality of audio sample frames acquired from the monitored audio stream. combination of hardware and software. Accordingly, while the following describes example systems, persons of ordinary skill in the art will readily appreciate that the examples provided are not the only way to implement such systems. described herein may be implemented using intraframe operations (e.g., operations based on sample data within a single frame). Intraframe operations may include, for example, comparison operations, determining percentage differences between values, etc. that are performed on two or more values (e.g., spectral power values) that are uniquely associated with or derived from a single frame. For example, using the methods and apparatus described herein, a digital spectral signature may be generated by obtaining a frame of media samples, determining spectral power values by performing a spectral transform (e.g., a FFT, a wavelet transform, etc.) on the frame of media samples, and performing an intraframe operation (e.g., a comparison) based on two or more spectral power values that are uniquely associated with the frame of media samples. Monitored signatures may be generated at a monitoring site based on audio streams associated with media information (e.g., a monitored audio stream) that is consumed by an audience. For example, a monitored signature may be generated based on the audio track of a television program presented at a monitoring site. The monitored signature may _ theti"lle ammurffdated1 to axemM-data collection facility for comparison to one or more reference signatures. As described below in connection with FIGS. 2 and 3, more reference signatures are generated at a reference site and/or a central data collection facility for a given audio stream than monitored signatures generated for a given audio stream at a monitoring site. In particular, the reference signatures generated for an audio stream (i.e., a reference audio stream) overlap in time. More specifically, the starting reference time or timestamp of each reference signature is shifted by a relatively small amount of time from the starting reference time or timestamp of a previous reference signature. In this manner, a monitored signature generated at a monitoring site and having a substantially arbitrary reference time may be aligned and/or matched with at least one of the reference signatures generated for a reference audio stream. As a result of the relatively fewer number of monitored signatures generated at the monitoring site, monitored signatures may be generated by processor systems and/or ,, , ... hardware^ devices' havihg relatively1 li'ss computing power and/or memory than processor systems and/or hardware devices used to generate reference signatures. FIGS. IA and IB illustrate example audio stream identification systems 100 and 150 for generating digital spectral signatures and identifying audio streams. The example audio stream identification systems 100 and 150 may be implemented as a television broadcast information identification system and a radio broadcast information identification system, respectively. The example audio stream identification system 100 includes a monitoring site 102 (e.g., a monitored household), a reference site 104, and a central data collection facility 106. [0Ui% 1 •Tnl'pfiyaWty" dFmeiatfdelϊvery devices 110 may include, for example, set top box tuners (e.g., cable tuners, satellite tuners, etc. ), DVD players, CD players, radios, etc. Some or all of the media delivery devices 110 such as, for example, set top box tuners may be communicatively coupled to one or more broadcast information reception devices 116, which may include a cable, a satellite dish, an antenna, and/or any other suitable device for receiving broadcast information. The media delivery devices 110 may be configured to reproduce media information (e.g., audio information, video information, web pages, still images, etc.) based on, for example, broadcast information and/or stored information. Broadcast information may be obtained from the broadcast information reception devices 116 and stored information may be obtained from any information storage medium (e.g., a DVD, a CD, a tape, etc.). The media delivery devices 110 are communicatively coupled to the media presentation devices 112 and configurable to communicate media information to the media presentation devices 112 for presentation. The media presentation devices 112 may include televisions having a display device and/or a set of speakers by which audience members consume, for example, broadcast television information, music, movies, etc. The signature generator 114 may be used to generate monitored digital signatures based on audio information as described in greater detail below. In particular, at the monitoring site 102, the signature generator 114 may be configured to generate monitored signatures based on monitored audio streams that are reproduced by the media delivery devices 110 and/or presented by the media presentation devices 112. The signature generator 114 may be communicatively coupled to the media delivery devices 110 and/or the media presentation devices 112 via an audio monitoring interface 118. In this manner, the signature generator 114 may obtain audio streams associated with media information that is reproduced by the media delivery devices 110 and/or presented by the media presentation devices 112. Additionally or alternatively, the signature generator 114 may be communicatively coupled to microphones (not shown) that are placed in proximity to the media presentation devices 112 _, _ o llifcttoliWsWyimlfe^^e^gHfeitare generator 114 may also be communicatively coupled to the central data collection facility 106 via the network 108. As shown in FIG. 1 A, the reference site 104 may include a plurality of broadcast information tuners 120, a reference signature generator 122, a transmitter 124, a database or memory 126, and broadcast information reception devices 128. The reference signature generator 122 and the transmitter 124 may be communicatively coupled to the memory 126 to store reference signatures therein and/or to retrieve stored reference signatures therefrom. The reference signature generator 122 may be configured to obtain the audio portion of all of the media information that is available in a particular broadcast region. The reference signature generator 122 may then generate a plurality of reference signatures (as described in greater detail below) based on the audio information and store the reference signέfcά in^ne^^€n^bry^βy'. M't'nβlαgh one reference signature generator is shown in FIG. 1 , a plurality of reference signature generators may be used in the reference site 104. For example, each of the plurality of signature generators may be communicatively coupled to a respective one of the broadcast information tuners 120. The signature analyzer 132 may be used to compare reference signatures to monitored signatures. The signature analyzer 132 is communicatively coupled to the memory 134 and configured to retrieve the monitored signatures and the reference signatures from the same. The signature analyzer 132 may be configured to retrieve reference signatures and monitored signatures from the memory 134 and compare the monitored signatures to the reference signatures until a match is found. The memory 134 may be implemented using any machine accessible information storage medium such as, for example, one or more hard drives, one or more optical storage devices, etc. [0Ui% l! 132 is located at the central data collection facility 106 in FIG. IA, the signature analyzer 132 may instead be located at the reference site 104. In such a configuration, the monitored signatures may be communicated from the monitoring site 102 to the reference site 104 via the network 108. Alternatively, the memory 134 may be located at the monitoring site 102 and reference signatures may be added periodically to the memory 134 via the network 108 by transmitter 124. Additionally, although the signature analyzer 132 is shown as a separate device from the signature generators 114 and 122, the signature analyzer 132 may be integral with the reference signature generator 122 and/or the signature generator 114. Still further, although FIG. 1 depicts a single monitoring site (i.e., the monitoring site 102) and a single reference site (i.e., the reference site 104), multiple such sites may be coupled via the network 108 to the central data collection facility 106. The audio stream identification system 150 of FIG. IB may be configured to monitor and identify audio streams associated with radio broadcast information. In general, the audio stream identification system 150 is used to monitor the content that is broadcast by a plurality of radio stations in a particular broadcast region. Unlike the audio stream identification system 100 used to monitor television content consumed by an audience, the audio stream identification system 150 may be used to monitor music, songs, etc. that are broadcast within a broadcast region and the number of times that they are broadcast. This type of media tracking may be used to determine royalty payments, proper use of copyrights, etc. associated with each audio composition. The audio stream identification system 150 includes a monitoring site 152, a central data collection facility 154, and the network 108.
above in connection with FIG. IA. In addition, the monitoring site 152 includes a signature generator 156. When used in the audio stream identification system 150, the broadcast information reception devices 128 are configured to receive radio broadcast information and the broadcast information tuners 120 are configured to tune to the radio broadcast stations. The number of broadcast information tuners 120 at the monitoring site 152 may be equal to the number of radio broadcasting stations in a particular broadcast region. The central data collection facility 154 is configured to receive monitored signatures from the monitoring site 152, generate reference signatures based on reference audio streams, and compare the monitored signatures to the reference signatures. The central data collection facility 154 includes the receiver 130, the signature analyzer 132, and the memory 134, all of which are described in greater detail above in connection with FIG. IA. In addition, the central data collection facility 154 includes a reference signature generator 158.
data collection facility 154 to be added to a reference library. The reference signature generator 158 may read the audio data from the machine accessible medium and generate a plurality of reference signatures based on each audio work (e.g., the reference audio stream 302 of FIG. 3). The reference signature generator 158 may then store the reference signatures in the memory 134 for subsequent retrieval by the signature analyzer 132. Identification information (e.g., song title, artist name, track number, etc.) associated with each reference audio stream may be stored in a database and may be indexed based on the reference signatures. In this manner, the central data collection facility 154 includes a database of reference signatures and identification information corresponding to all known and available song titles. Although one monitoring site (e.g., the monitoring site 152) is shown in FIG. IB, multiple monitoring sites may be communicatively coupled to the network 108 and configured to generate monitored signatures. In particular, each monitoring site may be located in a respective broadcast region and configured to monitor the content of the broadcast stations within a respective broadcast region. FIG. 2 is a time-domain representation 200 of an example monitored audio stream 202 and a plurality of audio sample frames 204, 206, 208, and 210 acquired from the monitored audio stream 202. A monitored digital spectral signature is generated at a mo'ti'iϊori'hg skfeW.rftϊe nroniBrmg:1site 102 of FIG. IA or the monitoring site 152 of FIG. IB) based on audio samples acquired from the example monitored audio stream 202. The time-domain representation 200 illustrates the time relationship between the example monitored audio stream 202 and the audio sample frames 204, 206, 208, and 210, which are used to generate monitored signatures. In one example, an N-bit monitored signature Sx(I) is formed using one or more M-bit descriptors Bx(to), Bx(t0+\), Bx(to+2), Bx(to+3). For example, a 32-bit monitored signature Sx(t) includes four 8-bit descriptors Bx(to), Bx(to+\), Bx(to+2), Bx(to+3), each of which is generated based on a corresponding one of the audio sample frames 204, 206, 208, and 210. More specifically, each of the descriptors is generated using one or more intraframe operations (e.g., comparison operations) based on two or more spectral components that are uniquely associated with a single audio sample frame. The four descriptors may be generated based on spectral decompositions (e.g., frequency decompositions or wavelet decompositions) of the audio sample frames 204, 206, 208, and 210 as described in detail below in connection with FIGS. 4-7. The spectral decompositions are used to extract features that are uniquely characteristic of the example monitored audio stream 202. In this manner, a reference signature and a monitored signature that are generated based on the same audio stream using the same signature generation method (e.g., the same spectral decomposition-based method) will include similar features, and, thus can be used to reliably identify the monitored audio stream 202 using a matching algorithm. A monitored signature may be generated by sampling the example monitored audio stream 202 to generate the audio sample frames 204, 206, 208, and 210, generating the descriptors Bx(to), Bx(to+\), Bx(to+2), Bx(to+3) based on spectral decompositions of the audio sample frames 204, 206, 208, and 210, and concatenating the descriptors. For^anfple^a11 S1Mi )H^ freqtiMc'y/f of 6000 Hz will generate 6000 samples of audio data for each of the audio sample frames 204, 206, 208, and 210 (assuming the sample frames are collected over one second intervals). However, any other suitable sampling frequency /÷ may instead be selected. As shown in FIG. 2, the duration of each of the audio sample frames 204, 206, 208, and 210 is one second (e.g., 0 to t0, to to to+l, to+1 to to+2, and to+2 to to+3). However, the duration may instead be set to any other length of time. The times within the monitored audio stream 202 during which monitored signatures are generated are substantially similar or identical to the times within a reference audio stream during which corresponding reference signatures are generated. By acquiring audio sample frames for monitored signatures and reference signatures at substantially the same times, the features extracted from a monitored audio stream (e.g., the example monitored audio stream 202) and a corresponding reference audio stream (e.g., the example reference audio stream 302 of FIG. 3) are substantially similar or identical. Although, the audio sample frames 204, 206, 208, and 210 are shown in FIG. 2 as occurring consecutively in time, the audio sample frames 204, 206, 208, and 210 may occur at any time and in any sequence within the example monitored audio stream 202.
to substantially the same time within reference audio streams as indicated by the reference time to. ΘeMfpbr x(ή associated with the example monitored audio stream 202 (FIG. 2) and, thus, each N-bit reference signature SRn(I) includes the same number of bits as a corresponding N-bit monitored signature Sx(ή.
set equal to 6000 Hz, each sample segment will include 200 samples. common set of sample segments 312b-312e. In addition, two audio sample frames that overlap also contain sample segments that are exclusive to one or the other of the audio sample frames (i.e., audio sample frames that overlap also contain sample segments that occur in one or the other of the audio sample frames but do not occur in both frames). are not dependent on sample data collected over other audio frames. subsequent generation of the reference signatures and to provide a corresponding set of data collection times to a reference memory (e.g., the memory 126 of FIG. IA) for storage. Thus, each reference signature is stored in a memory device located at the reference site along with timestamp data indicating the time at which the underlying audio data was collected. In one example, the timing devices (e.g., the timing device 903 of FIG. 9) located at the monitoring site and the reference site are synchronized such that the timestamps can be used to align the ( reference* signMilrel ϊthfhV Mϊtdred signatures to facilitate the signature matching process. Likewise, because a plurality of monitoring sites are likely to be located in the same broadcast region as a single reference site, in the same example, each of the timing devices 903 located in each such monitoring site may be synchronized with the timing device 903 located in the single reference site. However, due to the staggered arrangement of the reference signatures described above in connection with FIG. 3, the timing devices 903 at the monitoring site and the reference site do not have to be synchronized. devices located at a monitoring site and a reference site, each monitored signature generated at the monitoring site at a time T need only be compared to all reference signatures generated from data collected within a window of the time spanning from T - E to T + E.
 In another example system (e.g., the example audio identification system 150 of FIG. IB), a set of monitored signatures are generated for a monitored audio stream and then compared to a database of reference signatures associated with a set of reference audio streams that, ideally, represent the universe of currently available audio streams. For example, as described above, in connection with FIG. IB, reference signatures corresponding to reference audio streams may be stored in a database that is stored in, for example, the memory 134. For each reference signature that is matched to a monitored signature, the matching information and/or the reference signature may be used to retrieve identification information (e.g., song title, song track, artist, etc.) from the database. The identification information is then used to identify the monitored audio stream. In one example, reference times to or timestamps associated with each monitored signature may be used to identify the time (of day) at which the monitored audio streams were broadcast. The initial audio sample set may be a complete audio sample frame (e.g., one of the audio sample frames 204, 206, 208, and 210 of FIG. 2 or 304, 306, 308, and 310 of FIG. 3) or a portion thereof. An initial FFT operation is performed on the initial audio sample set to establish an initial frequency spectrum (block 408JVLTlleiny!n!i8'^f^erfόrffliri^% FFT is well known in the art and, thus, is not discussed in detail herein. vw _2 and vN _, according to Equation 1 below. samples v0 and v, . [Oό'όW IS • λltferl!th 'sϊidiffg FFT ϊs' determined or calculated at block 412, it is determined if a complete audio sample frame (e.g., one of the audio sample frames 204, 206, 208, and 210 of FIG. 2 or one of the audio sample frames 304, 306, 308, and 310 of FIG. 3) has been obtained (block 414). At the monitoring sites 102 (FIG. IA) and 152 (FIG. IB), a complete audio sample frame is obtained when a plurality of most recently collected Ns samples is obtained. For example, if an audio sample frame includes 6000 samples, a complete audio sample frame is obtained after 6000 new samples are obtained. At the reference site 104 (FIG. IA) or the central data collection facility 154 (FIG. IB), a complete audio sample frame is obtained when a most recently collected sample segment (e.g., one of the sample segments 312a-312f of FIG. 3) is obtained and a current audio sample frame is formed as described in greater detail above in connection with FIG. 3. If it is determined at block 414 that a complete audio sample frame has not been obtained, control is passed back to block 410. However, if it is determined at block 414 that a complete audio sample frame has been obtained, a descriptor is generated (block 416). An example method for generating descriptors based on frequency components is described in greater detail below in connection with FIG. 5. 0 < / < /indexmax and O ≤ Zx M .
 The example method initially selects a first pair of frequency componentsyoo and /10 (block 502). Although consecutive frequency components are selected (i.e., yub and/ϊb>./2b and fa,, etc.) in the example method, the frequency components may be selected from any location in the frequency spectrum of an audio sample frame (e.g., one of the audio sample frames 204, 206, 208, and 210 of FIG. 2 or one of the audio sample frames 304, 306, 308, and 310 of FIG. 3). However, the frequency component indexes / used to select pairs of frequency components for generating a monitored signature are the same frequency component indexes / used to select pairs of frequency components for generating a corresponding reference signature. After the first pair of frequency components T00 and /^0 is selected, the spectral powers Poo and P\o corresponding to the selected frequency components are determined (block 504). One of ordinary skill in the art will readily appreciate that the spectral power for each frequency component can be obtained based on the results of the sliding FFT performed at block 412 of FIG. 4.
the descriptor bit is set equal to zero. It is then determined if another descriptor bit is to be determined (block 508). If another descriptor bit is to be determined, another pair of frequency components is selected (e.g., f2\ and β\) (block 510) and control is passed back to block 504. If, instead, another descriptor bit is not to be determined, the example method of FIG. 5 may be stopped. on wavelet decomposition performed using a wavelet transform. An example method for generating descriptors based on one or more wavelet decompositions is described in greater detail below in connection with FIG. 7. 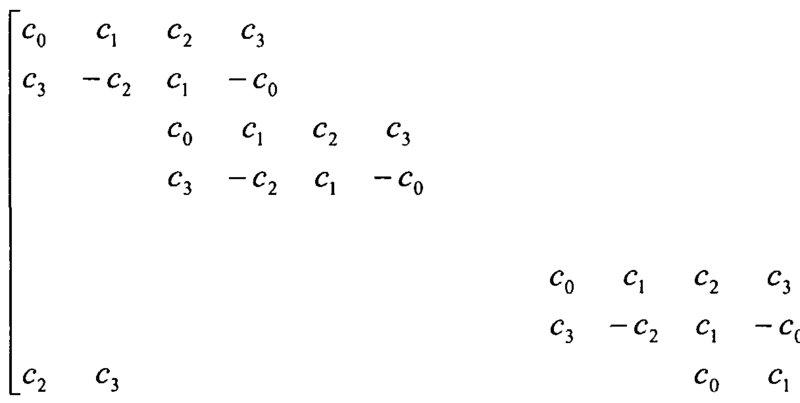 Turning in greater detail to the Daubechies wavelet transform implementation, the Daubechies coefficients CQ, C\, C2, and c3 are used to generate an Ns x Ns transformation matrix in which the coefficients are arranged as shown below. sub-band frequencies ranging from -1- to . to the low-frequency sub-band block LQ to generate two additional sub-band blocks L1 and H1. For each transformation, the number of filtered values in each sub-band block is halved. Additionally, for each transformation, a descriptor is generated based on a high-frequency sub-band block (e.g., H0, Hi, H2, etc.). Further details related to the implementation of wavelet transforms are well known in the art and are not described herein. After the first-level wavelet transform is applied, the high-frequency sub-band block Ho is parsed by separating the filtered values into a first half and a second half (block 704). Next, at a block 706, a first energy value E0 is determined by squaring and summing the filtered values of the first half of the high-frequency sub-band block H0 and a second energy value Ei is also determined (block 706) by squaring and summing the filtered values of the second half of the high-frequency sub-band block H0. 710 that another descriptor bit is not to be determined, the example method of FIG. 7 may be stopped. indicated by the reference time t0 is obtained from, for example, the memory 134 of FIGS. IA and IB (block 806). The first descriptor of the monitored signature and the first descriptor of the reference signature are then obtained (block 808). reference audio stream. The operation of block 808 may be configured to obtain the first descriptor of each of the plurality of reference signatures retrieved at block 806. The descriptors of each of the reference signatures may be compared with the each descriptor of the monitored signature until a match is found or until the plurality of reference signatures obtained at block 806 is eliminated, after which time another plurality of reference signatures may be obtained at block 820.
on the monitored audio stream will match all of the reference signatures of more than one reference audio stream, and, thus erroneously matching more than one reference audio stream to the monitored audio stream can be prevented. FIG. 9 is a block diagram of an example signature generation system 900 for generating digital spectral signatures. In particular, the example signature generation system 900 may be used to generate monitored signatures and/or reference signatures based on a sliding FFT as described above in connection with the example methods of FIGS. 4 and 5. For example, the example signature generation system 900 may be used to implement the signature generators 114 and 122 of FIG. IA or the signature generators 156 and 158 of FIG. IB. Additionally, the example signature generation system 900 may be used to implement the example methods of FIGS. 4 and 5. As shown in FIG. 9, the example signature generation system 900 includes a sample generator 902, a timing device 903, a reference time generator 904, a sliding FFT module 906, a frequency identifier 908, a spectral power value identifier 910, a comparator 912, a descriptor generator 914, a concatenator 916, and a data communication interface 918, all of which may be communicatively coupled as shown. The example signature generation system 900 may be configured to obtain an example audio stream 920, acquire a plurality of audio samples from the example audio stream 920, and generate digital spectral signatures based on the audio samples. _ , lf ■'ttέiynpii gen'eiitlόrl|9b2'may be configured to obtain the example audio stream 920, which may be any analog or digital audio stream. If the example audio stream 920 is an analog audio stream, the sample generator 902 may be implemented using an analog-to- digital converter. If the example audio stream 920 is a digital audio stream, the sample generator 902 may be implemented using a digital signal processor. Additionally, the sample generator 902 may be configured to acquire and/or extract audio samples at any desired sampling frequency^ and notify the reference time generator 904 when an audio sample acquisition process begins. The sample generator 902 communicates samples to the sliding FFT module 906. The sample generator 902 may also be configured to notify the frequency identifier 908 when an audio sample frame (e.g., one of the audio sample frames 204, 206, 208, and 210 of FIG. 2 or 304, 306, 308, and 310 of FIG. 3) or a sample segment (e.g., one of the sample segments 312a-f of FIG. 3) has been generated. The reference time generator 904 may initialize a reference time t0 when a notification is received from the sample generator 902. As described above in connection with FIGS. 2 and 3, the reference time to may be used to indicate the time within an audio stream at which a signature is generated. In particular, the reference time generator 904 may be i fe £δbtømg£Wateerøά\anMiimeKάl£tM/or a timestamp value from the timing device 903 when notified of the beginning of a sample acquisition process by the sample generator 902. The reference time generator 904 may then store the timestamp value as the reference time to. ΛeNiJdiJg^H^! !ϊadl/9δ6.1:iΩe:§F«ctra1 power values may then be communicated to the comparator 912. The concatenator 916 may obtain descriptor values from the descriptor generator 914. When a complete set of descriptors is obtained, the concatenator 916 may concatenate the descriptors 916 to form a digital spectral signature. The data communication interface 918 may obtain the digital spectral signatures from the concatenator 916 and the reference time to corresponding to the digital spectral signature and communicate the same to a memory and/or a reference site. For example, if the example signature generation system 900 is configured to generate monitored signatures at the monitoring site 102 (FIG. 1 A), the monitored signatures may be communicated to the central data collection facility (FIG. IA) via the network 108 (FIG. IA). Alternatively, if the example signature generation system 900 is configured to generate reference signatures, the reference signatures may be communicated to the central data collection facility 154 (FIG. IB) and/or stored in the memory 134 (FIG. IB). alternatively, the example signature generation system 1000 may be used to implement the signature generators 156 and 158 of FIG. IB. In addition, the example signature generation system 1000 may be used to implement the example methods of FIGS. 6 and 7. 1006 may be configured to generate energy values Ex based on the high-frequency sub-band block. The energy value generator 1006 may be configured to parse or separate the high-frequency sub-band block into a first half of filtered data values and a second half of filtered data values as described in greater detail above in connection with FIG. 7. The energy value generator 1006 may then generate a first energy value E0 by squaring and summing the first half of filtered data values. A second energy value Ei may be generated by squaring and summing the second half of filtered data values. media identification look-up table interface 11 12, all of which may be communicatively coupled as shown. The monitored signature receiver 1102 may be configured to obtain monitored signatures via the network 106 (FIG. 1) and communicate the monitored signatures to the comparator 1106. The reference signature receiver 1104 may be configured to obtain reference signatures from the memory 134 (FIGS. IA and IB) and communicate the reference signatures to the comparator 1106. [0(JH'i'4] 8 ■ lFl<!yr';illiis:ιk'b c¥( ϊ aτn of an example processor system 1210 that may be used to implement the apparatus and methods described herein. As shown in FIG. 12, the processor system 1210 includes a processor 1212 that is coupled to an interconnection bus or network 1214. The processor 1212 includes a register set or register space 1216, which is depicted in FIG. 12 as being entirely on-chip, but which could alternatively be located entirely or partially off-chip and directly coupled to the processor 1212 via dedicated electrical connections and/or via the interconnection network or bus 1214. The processor 1212 may be any suitable processor, processing unit or microprocessor. Although not shown in FIG. 12, the system 1210 may be a multi -processor system and, thus, may include one or more additional processors that are identical or similar to the processor 1212 and that are communicatively coupled to the interconnection bus or network 1214. The processor 1212 of FIG. 12 is coupled to a chipset 1218, which includes a memory controller 1220 and an input/output (I/O) controller 1222. As is well known, a chipset typically provides I/O and memory management functions as well as a plurality of general purpose and/or special purpose registers, timers, etc. that are accessible or used by one or more processors coupled to the chipset. The memory controller 1220 performs functions that enable the processor 1212 (or processors if there are multiple processors) to access a system memory 1224 and a mass storage memory 1225. The system memory 1224 may include any desired type of volatile and/or non¬ volatile memory such as, for example, static random access memory (SRAM), dynamic random access memory (DRAM), flash memory, read-only memory (ROM), etc. The mass storage memory 1225 may include any desired type of mass storage device including hard disk drives, optical drives, tape storage devices, etc. The I/O controller 1222 performs functions that enable the processor 1212 to communicate with peripheral input/output (I/O) devices 1226 and 1228 via an I/O bus 1230. The I/O devices 1226 and 1228 may be any desired type of I/O device such as, for example, a kefb'lardVa' fey la/or ffitoir; a mouse, etc. While the memory controller 1220 and the I/O controller 1222 are depicted in FIG. 12 as separate functional blocks within the chipset 1218, the functions performed by these blocks may be integrated within a single semiconductor circuit or may be implemented using two or more separate integrated circuits. 1. A method for generating signatures, comprising: obtaining a first frame of media samples; identifying a first frequency component having a first spectral power and a second frequency component having a second spectral power by performing a spectral transform operation on the first frame of media samples; determining a first descriptor of the first frame of media samples based on a comparison of the first spectral power and the second spectral power; and generating a first signature based on the first descriptor. 2. A method as defined in claim 1 , further comprising identifying media information based on the first signature. Es »"έ:dih claim 6, fiirther comprising: identifying a third spectral power associated with a third frequency component and a fourth spectral power associated with a fourth frequency component, wherein the third frequency component and the fourth frequency component are associated with performing the spectral transform operation on the second frame of media samples; determining a second descriptor based on a comparison of the third spectral power and the fourth spectral power; and generating a second signature based on the second descriptor. 9. A method as defined in claim 1 , wherein the spectral transform operation is a sliding Fast Fourier Transform. 10. A method as defined in claim 1, further comprising determining a reference time value associated with the first frame of media samples. 11. A method as defined in claim 1 , wherein the first signature is at least one of a reference signature and a monitored signature. in claim 12, wherein the instructions stored in the memory enable the processor system to identify media information based on the first signature. 15. An apparatus as defined in claim 13, wherein the media information is associated with at least one of audio information and video information. 17. An apparatus as defined in claim 12, wherein the instructions stored in the memory enable the processor system to: obtain a first plurality of media samples; and identify a second frame of media samples by extracting a common plurality of media samples from the first frame of media samples and appending the first plurality of media samples to the common plurality of media samples. 18. An apparatus as defined in claim 17, wherein the instructions stored in the memory enable the processor system to: identify a third spectral power associated with a third frequency component and a fourth spectral power associated with a fourth frequency component, wherein the third frequency component and the fourth frequency component are associated with performing the spectral transform operation on the second frame of media samples; determine a second descriptor based on a comparison of the third spectral power and the fourth spectral power; and generate a second signature based on the second descriptor. in claim 12, wherein the spectral transform operation is a sliding Fast Fourier Transform. 21. An apparatus as defined in claim 12, wherein the instructions stored in the memory enable the processor system to determine a reference time value associated with the first frame of media samples. 22. An apparatus as defined in claim 12, wherein the first signature is at least one of a reference signature and a monitored signature. 23. A machine accessible medium having instructions stored thereon that, when executed, cause a machine to: obtain a first frame of media samples; identify a first frequency component having a first spectral power and a second frequency component having a second spectral power by performing a spectral transform operation on the first frame of media samples; determine a first descriptor of the first frame of media samples based on a comparison of the first spectral power and the second spectral power; and generate a first signature based on the first descriptor. 24. A machine accessible medium as defined in claim 23 having instructions stored thereon that, when executed, cause the machine to identify media information based on the first signature. 25. A machine accessible medium as defined in claim 24, wherein a Hamming distance is used to identify the media information based on the first signature. 26. A machine accessible medium as defined in claim 24, wherein the media information is associated with at least one of audio information and video information. as defined in claim 23 having instructions stored thereon that, when executed, cause the machine to: obtain a first plurality of media samples; and identify a second frame of media samples by extracting a common plurality of media samples from the first frame of media samples and appending the first plurality of media samples to the common plurality of media samples. 29. A machine accessible medium as defined in claim 28 having instructions stored thereon that, when executed, cause the machine to: identify a third spectral power associated with a third frequency component and a fourth spectral power of a fourth frequency component, wherein the third frequency component and the fourth frequency component are associated with performing the spectral transform operation on the second frame of media samples; determine a second descriptor based on a comparison of the third spectral power and the fourth spectral power; and generate a second signature based on the second descriptor. 30. A machine accessible medium as defined in claim 23, wherein the second descriptor is of the second frame of media samples. 31. A machine accessible medium as defined in claim 23, wherein the spectral transform operation is a sliding Fast Fourier Transform. 32. A machine accessible medium as defined in claim 23, wherein the instructions stored in the memory enable the processor system to determine a reference time value associated with the first frame of media samples. ϊorl aMng signatures, comprising: identifying a first plurality of filtered values by performing a wavelet transform on a first frame of media samples; determining a first energy value based on a first portion of the first plurality of filtered values; determining a second energy value based on a second portion of the first plurality of filtered values; determining a first descriptor of the first frame of media samples based on a comparison of the first energy value and the second energy value; and generating a first signature based on the first descriptor. 35. A method as defined in claim 34, wherein the first plurality of filtered values is associated with a high-frequency sub-band of the first frame of media samples. 36. A method as defined in claim 34, wherein the first descriptor is associated with only the first frame of media samples. 37. A method as defined in claim 34, further comprising: obtaining a first plurality of media samples; and identifying a second frame of audio samples by extracting a common plurality of media samples from the first frame of media samples and appending the first plurality of media samples to the common plurality of media samples. μ 1[.Ii3S8," U^ o-d Ss fiMStfn claim 37, further comprising: identifying a second plurality of filtered values by performing the wavelet transform on the second frame of media samples; determining a third energy value based on a first portion of the second plurality of frequency values; determining a fourth energy value based on a second portion of the second plurality of frequency values; determining a second descriptor based on a comparison of the third energy value and the fourth energy value; and generating a second signature based on the second descriptor. 39. A method as defined in claim 38, wherein the second descriptor is of the second frame of media samples. 40. A method as defined in claim 34, wherein the wavelet transform is based on a Daubechies wavelet transform. 41. A method as defined in claim 34, further comprising determining a reference time value associated with the first frame of media samples. 42. A method as defined in claim 34, further comprising identifying media information based on the first signature. 43. A method as defined in claim 42, wherein a Hamming distance is used to identify the media information based on the first signature. 44. A method as defined in claim 42, wherein the media is associated with at least one of audio information and video information. signatures, comprising: a processor system including a memory; and instructions stored in the memory that enable the processor system to: identify a first plurality of filtered values by performing a wavelet transform on a first frame of media samples; determine a first energy value based on a first portion of the first plurality of filtered values; determine a second energy value based on a second portion of the first plurality of filtered values; determine a first descriptor of the first frame of media samples based on a comparison of the first energy value and the second energy value; and generate a first signature based on the first descriptor. 47. An apparatus as defined in claim 46, wherein the first plurality of filtered values is associated with a high-frequency sub-band of the first frame of media samples. 48. An apparatus as defined in claim 46, wherein the first descriptor is associated with only the first frame of media samples. in claim 49, wherein the instructions stored in the memory enable the processor system to: identity a second plurality of filtered values by performing the wavelet transform on the second frame of media samples; determine a third energy value based on a first portion of the second plurality of frequency values; determine a fourth energy value based on a second portion of the second plurality of frequency values; determine a second descriptor based on a comparison of the third energy value and the fourth energy value; and generate a second signature based on the second descriptor. 51. An apparatus as defined in claim 50, wherein the second descriptor is of the second frame of media samples. 52. An apparatus as defined in claim 46, wherein the wavelet transform is based on a Daubechies wavelet transform. 53. An apparatus as defined in claim 46, wherein the instructions stored in the memory enable the processor system to determine a reference time value associated with the first frame of media samples. 54. An apparatus as defined in claim 46, wherein the instructions stored in the memory enable the processor system to identify media information based on the first signature. 55. An apparatus as defined in claim 54, wherein a Hamming distance is used to identify the media information based on the first signature. 56. An apparatus as defined in claim 54, wherein the media is associated with at least one of audio information and video information. having instructions stored thereon that, when executed, cause a machine to: identify a first plurality of filtered values by performing a wavelet transform on a first frame of media samples; determine a first energy value based on a first portion of the first plurality of filtered values; determine a second energy value based on a second portion of the first plurality of filtered values; determine a first descriptor of the first frame of media samples based on a comparison of the first energy value and the second energy value; and generate a first signature based on the first descriptor. 59. A machine accessible medium as defined in claim 58, wherein the first plurality of filtered values is associated with a high-frequency sub-band of the first frame of media samples. 60. A machine accessible medium as defined in claim 58, wherein the first descriptor is associated with only the first frame of media samples. 61. A machine accessible medium as defined in claim 58 having instructions stored thereon that, when executed, cause the machine to: obtain a first plurality of media samples; and identify a second frame of audio samples by extracting a common plurality of media samples from the first frame of media samples and appending the first plurality of media samples to the common plurality of media samples. as defined in claim 61 having instructions stored thereon that, when executed, cause the machine to: identify a second plurality of filtered values by performing the wavelet transform on the second frame of media samples; determine a third energy value based on a first portion of the second plurality of frequency values; determine a fourth energy value based on a second portion of the second plurality of frequency values; determine a second descriptor based on a comparison of the third energy value and the fourth energy value; and generate a second signature based on the second descriptor. 63. A machine accessible medium as defined in claim 62, wherein the second descriptor is of the second frame of media samples. 64. A machine accessible medium as defined in claim 58, wherein the wavelet transform is based on a Daubechies wavelet transform. 65. A machine accessible medium as defined in claim 58 having instructions stored thereon that, when executed, cause the machine to determine a reference time value associated with the first frame of media samples. 66. A machine accessible medium as defined in claim 58 having instructions stored thereon that, when executed, cause the machine to identify media information based on the first signature. 67. A machine accessible medium as defined in claim 66, wherein a Hamming distance is used to identify the media information based on the first signature. defined in claim 58, wherein the first signature is one of a reference signature and a monitored signature. 70. A method for generating signatures, comprising: obtaining a first plurality of time domain media samples; determining frequency spectrum information based on the first plurality of time domain media samples; obtaining a second plurality of time domain media samples; updating the frequency spectrum information based on the second plurality of time domain media samples; identifying a first frequency component and a second frequency component based on the frequency spectrum information; determining a first spectral power value associated with the first frequency component and a second spectral power value associated with the second frequency component; determining a descriptor bit value based on a comparison of the first spectral power value and the second spectral power value; and generating a signature based on the first descriptor bit value. 71. A method as defined in claim 70, wherein a Hamming distance is used to identify media information based on the signature. 72. A method as defined in claim 71, wherein the media information is associated with at least one of audio information and video information. 73. A method as defined in claim 70, further comprising determining a reference time value associated with the first plurality of time domain media samples. 74. A method as defined in claim 70, wherein the signature is at least one of a reference signature and a monitored signature. " '" 75. Ah apparatus for generating signatures, compπsing: a processor system including a memory; and instructions stored in the memory that enable the processor system to: obtain a first plurality of time domain media samples; determine frequency spectrum information based on the first plurality of time domain media samples; obtain a second plurality of time domain media samples; update the frequency spectrum information based on the second plurality of time domain media samples; identify a first frequency component and a second frequency component based on the frequency spectrum information; determine a first spectral power value associated with the first frequency component and a second spectral power value associated with the second frequency component; determine a descriptor bit value based on a comparison of the first spectral power value and the second spectral power value; and generate a signature based on the first descriptor bit value. 76. An apparatus as defined in claim 75, wherein a Hamming distance is used to identify media information based on the signature. 77. An apparatus as defined in claim 76, wherein the media information is associated with at least one of audio information and video information. 78. An apparatus as defined in claim 75, wherein the instructions stored in the memory enable the processor system to determine a reference time value associated with the first plurality of time domain media samples. stored thereon that, when executed, cause a machine to: obtain a first plurality of time domain media samples; determine frequency spectrum information based on the first plurality of time domain media samples; obtain a second plurality of time domain media samples; update the frequency spectrum information based on the second plurality of time domain media samples; identify a first frequency component and a second frequency component based on the frequency spectrum information; determine a first spectral power value associated with the first frequency component and a second spectral power value associated with the second frequency component; determine a descriptor bit value based on a comparison of the first spectral power value and the second spectral power value; and generate a signature based on the first descriptor bit value. 81. A machine accessible medium as defined in claim 80, wherein a Hamming distance is used to identify media information based on the signature. 82. A machine accessible medium as defined in claim 81 , wherein the media information is associated with at least one of audio information and video information. 83. A machine accessible medium as defined in claim 80 having instructions stored thereon that, when executed, cause a machine to determine a reference time value associated with the first plurality of time domain media samples. 84. A machine accessible medium as defined in claim 80, wherein the signature is at least one of a reference signature and a monitored signature. IP C$/ ILi y pkaffi :ig'eW§rating signatures, comprising: a sliding Fast Fourier Transform module for generating frequency spectrum information associated with a plurality of media samples; a frequency identifier configured to identify a plurality of frequency components in the frequency spectrum information; a spectral power value identifier configured to identify a plurality of spectral power values based on the plurality of frequency components; a descriptor generator configure to generate a plurality of descriptors based on comparisons of the plurality of spectral power values; and a concatenator configured to generate a plurality of digital spectral signatures by concatenating two or more of the plurality of descriptors. 86. An apparatus as defined in claim 85, wherein the frequency identifier is configured to identify at least one of the plurality of frequency components in response to at least one of a new media sample frame notification and a new sample segment notification. 87. An apparatus as defined in claim 85, wherein at least some of the plurality of media samples form a plurality of media sample frames. 88. An apparatus as defined in claim 87, wherein the descriptor generator is configured to generate at least one of the plurality of descriptors based on at least one of the plurality of media sample frames. 89. An apparatus as defined in claim 87, wherein a first one of the plurality of media sample frames includes at least some of the plurality of media samples that form a portion of a second one of the plurality of media sample frames. 90. An apparatus as defined in claim 85, wherein each of the plurality of digital spectral signatures is at least one of a monitored signature and a reference signature. P 9J/ VfotyføM geae ύng signatures, comprising: a wavelet transform module for generating a plurality of filtered values associated with a plurality of media samples; a sub-band block identifier for identifying a plurality of low-frequency sub-band blocks and a plurality of high-frequency sub-band blocks based on the plurality of media samples; an energy value generator for generating a plurality of energy values based on the plurality of sub-band blocks; a descriptor generator for generating a plurality of descriptors based on comparisons of the plurality of energy values; and a concatenator for generating a plurality of digital spectral signatures by concatenating two or more of the plurality of descriptors. 92. An apparatus as defined in claim 91, wherein the wavelet transform module performs a Daubechies wavelet transform based on the plurality of media samples. 93. An apparatus as defined in claim 91, wherein the plurality of media samples form a plurality of media sample frames. 94. An apparatus as defined in claim 93, wherein the descriptor generator generates at least one of the plurality of descriptors based on at least one of the plurality of media sample frames. 95. An apparatus as defined in claim 93, wherein a first set of the plurality of media sample frames includes at least some of the plurality of media samples that form a portion of a second set of the plurality of media sample frames. 96. An apparatus as defined in claim 91 , wherein the plurality of digital spectral signatures are at least one of a monitored signature and a reference signature. 11 ' 97. An apparatus as denned in claim 91 , wherein the low- frequency sub-band block and the high-frequency sub-band block are identified by de-interleaving at least some of the plurality of filtered values. 98. An apparatus as defined in claim 91 , wherein the wavelet transform module is configurable to perform a multiple-level wavelet decomposition based on the filtered values. 99. An apparatus as defined in claim 98, wherein the plurality of descriptors are generated based on the multiple-level wavelet decomposition. 100. A method for generating signatures, comprising: obtaining a first frame of media samples; identifying a first frequency having a first spectral power by performing a spectral transform operation on the first frame of media samples; identifying a second frequency having a second spectral power based on the spectral transform operation; determining a first descriptor of the first frame of media samples based on a comparison of the first spectral power and the second spectral power; and generating a first signature based on the first descriptor. 101. A method as defined in claim 100, wherein the first descriptor is associated with only the first frame of media samples. 102. A method as defined in claim 100, further comprising: obtaining a first plurality of media samples; and identifying a second frame of media samples by extracting a common plurality of media samples from the first frame of media samples and appending the first plurality of media samples to the common plurality of media samples. ^ L 1 bϊ. lf JIMetldd ES »§αin claim 102, further comprising: identifying a third spectral power associated with a third frequency and a fourth spectral power associated with a fourth frequency, wherein the third frequency and the fourth frequency are associated with performing the spectral transform operation on the second frame of media samples; determining a second descriptor based on a comparison of the third spectral power and the fourth spectral power; and generating a second signature based on the second descriptor. 104. A method as defined in claim 103, wherein the second descriptor is of the second frame of media samples. 105. A method as defined in claim 100, wherein the spectral transform operation is a sliding Fast Fourier Transform. 106. An apparatus for generating signatures, comprising: a processor system including a memory; and instructions stored in the memory that enable the processor system to: obtain a first frame of media samples; identify a first frequency having a first spectral power by performing a spectral transform operation on the first frame of media samples; identify a second frequency having a second spectral power based on the spectral transform operation; determine a first descriptor of the first frame of media samples based on a comparison of the first spectral power and the second spectral power; and generate a first signature based on the first descriptor. IP- C uM<ip$aϊaBsii"ΑEM£d in claim 106, wherein the first descriptor is associated with only the first frame of media samples. 108. An apparatus as defined in claim 106, wherein the instructions stored in the memory enable the processor system to: obtain a first plurality of media samples; and identify a second frame of media samples by extracting a common plurality of media samples from the first frame of media samples and appending the first plurality of media samples to the common plurality of media samples. 109. An apparatus as defined in claim 108, wherein the instructions stored in the memory enable the processor system to: identify a third spectral power associated with a third frequency and a fourth spectral power associated with a fourth frequency, wherein the third frequency and the fourth frequency are associated with performing the spectral transform operation on the second frame of media samples; determine a second descriptor based on a comparison of the third spectral power and the fourth spectral power; and generate a second signature based on the second descriptor. 110. An apparatus as defined in claim 109, wherein the second descriptor is of the second frame of media samples. 111. An apparatus as defined in claim 106, wherein the spectral transform operation is a sliding Fast Fourier Transform. IH* "--1% 2". ^"''^''niacnϊnd^cC^ffile'niedium having instructions stored thereon that, when executed, cause a machine to: obtain a first frame of media samples; identify a first frequency having a first spectral power by performing a spectral transform operation on the first frame of media samples; identify a second frequency having a second spectral power based on the spectral transform operation; determine a first descriptor of the first frame of media samples based on a comparison of the first spectral power and the second spectral power; and generate a first signature based on the first descriptor. 113. A machine accessible medium as defined in claim 112, wherein the first descriptor is associated with only the first frame of media samples. 114. A machine accessible medium as defined in claim 112 having instructions stored thereon that, when executed, cause the machine to: obtain a first plurality of media samples; and identify a second frame of media samples by extracting a common plurality of media samples from the first frame of media samples and appending the first plurality of media samples to the common plurality of media samples. stored thereon that, when executed, cause the machine to: identify a third spectral power associated with a third frequency and a fourth spectral power associated with a fourth frequency, wherein the third frequency and the fourth frequency are associated with performing the spectral transform operation on the second frame of media samples; determine a second descriptor based on a comparison of the third spectral power and the fourth spectral power; and generate a second signature based on the second descriptor. 116. A machine accessible medium as defined in claim 115, wherein the second descriptor is of the second frame of media samples. 117. A machine accessible medium as defined in claim 112, wherein the spectral transform operation is a sliding Fast Fourier Transform. MX2007002071A MX2007002071A (en) 2004-08-18 2005-08-18 Methods and apparatus for generating signatures.